Mastering your business or household Coulsdon waste disposal isn’t something you want to spend hours on. That is why at Go Rubbish Go we offer cost-effective and efficient rubbish removal CR5 services throughout the Coulsdon area. With no long forms to fill in or complicated choices to make, you can have your job sorted in just a matter of minutes. All you need to do is tell us what you want collecting and when, and our experts will take care of the rest. We have an incredible range of regular and one-off CR5 waste collection services so we can manage any of your waste related needs with ease. To get yours booked in call 020 8610 9182 now! If you’re concerned about how much our premier services are going to set you back then let us put your mind at ease. Our rubbish removal services in Coulsdon are offered at incredible prices with all sorts of special offers available throughout the year. So if you want to get a reliable service at half the normal price, we’re the only firm that you need! We’re so confident that you’ll be impressed with our service that we even offer an incredible money-back guarantee! With no hidden costs or cancellation charges, you can even enjoy a flexible and competitive service with nothing to worry about at all! Why Our Waste Clearance Team in Coulsdon are So Good At What We Do! We offer premier Coulsdon, CR5 rubbish removal services throughout the local CR5 area and are known for being the best in the business. To retain this title, we are constantly striving for excellence, training our workforce and investing in innovative, new facilities. 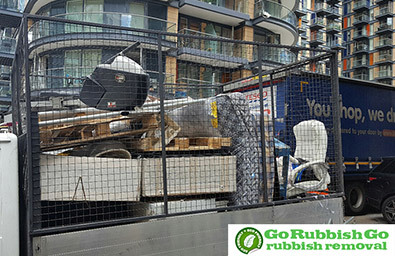 Unlike some other firms, we know there is more to rubbish disposal Coulsdon than just a clapped out old van and some heavy labourers, we know that disposing of waste is a real art! So if you want to hire a firm that is passionate about effective and efficient services, call us now on 020 8610 9182. Our customer services team can give you details about our impressive household and business services and will be happy to give you a free and no obligations quote over the phone! 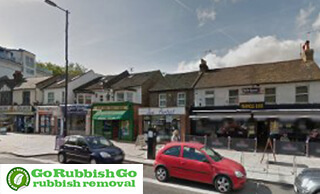 My compliments to Go Rubbish Go for the excellent waste clearance service they provided for my home in Coulsdon, CR5! Incredible attention to detail and very reasonable rates too! How Much Do We Recycle when Handling CR5 Rubbish Disposal? 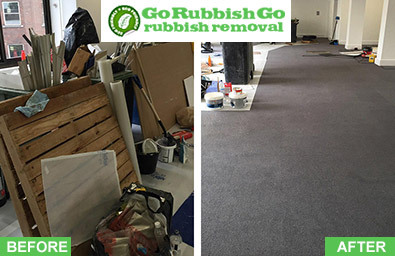 As well as making sure that we offer reliable and competitive services, we at Go Rubbish Go also take pride in offering eco-friendly waste disposal Coulsdon, CR5 services throughout the CR5 area. With excellent recycling facilities and a fully-trained team, we can salvage, reuse and recycle more waste than any other firm. Our policy is to recycle as more than 85% of the items we collect and we’ll do everything we can to make this target a reality. So if you want a firm that cares about the local environment, make sure you opt for one of our Coulsdon rubbish removal CR5 packages. Our recycling guidelines are more stringent than any other local firm, meaning that you can rely on us to look after the future of your community. So if you like the sound of using a reliable and eco-friendly local firm all you need to do is call us on 020 8610 9182. Our CR5 waste removal services are affordable and easy to hire and give you the flexibility you need to master your rubbish removal. Our speedy household services can help you with junk clear-outs and white goods recycling, while our commercial deals can keep your business waste under control. Our seven day a week service is even available to hire at short notice, with speedy next-day services at no extra cost. If your plans change or you need more time to get your junk sorted then you can cancel anytime. So if you don’t want to be stuck with your unwanted furniture, junk or waste, book your rubbish clearance in Coulsdon with us ASAP! Coulsdon is a town located in south London around 13 miles from Charing Cross. It is located in the London Borough of Croydon but parts of it are in the London Borough of Sutton as well as in Reigate and Banstead. The central area of the district has substantial industrial and distribution services. There are two main railway stations which are Coulsdon Town and Coulsdon South. The south-eastern part of the district is Old Coulsdon which offers great recreation options. There are also six listed buildings in the area which are famous for their architectural value. One of them is the Church of St John the Evangelist.